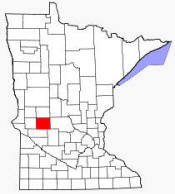 Pope County is a county located in the U.S. state of Minnesota. As of 2000, the population is 11,236. 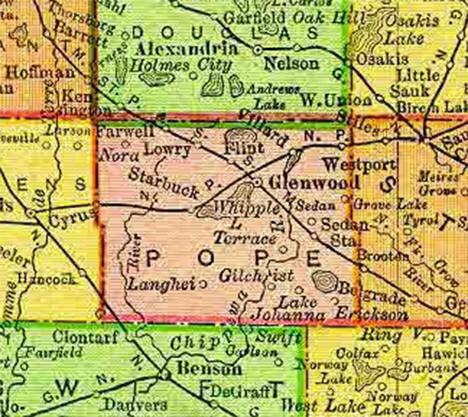 Its county seat is Glenwood. Three votes decided who won Pope County in the 2004 U.S. presidential election. Pope County was identified by the state legislature in 1862, and named for John Pope, a General in the Union Army who had earlier worked as a surveyor in the area. According to the U.S. Census Bureau, the county has a total area of 717 square miles (1,858 km²), of which, 670 square miles (1,736 km²) of it is land and 47 square miles (122 km²) of it (6.57%) is water. From "The New 11 x 14 Atlas of the World"